Fr. John Slavin prayed over the marker and blessed it. Linda Wohleber, representing the foundation, spoke to the congregation about the memorial’s significance. Taylor Wohleber Yoes, Linda’s daughter, helped her unveil the plaque. Taylor is a member of St. Gabriel’s, which is a mission station in the Diocese of Fort Worth. Linda belongs to a Roman Catholic congregation. She expressed gratitude to Fr. Slavin for volunteering to set aside the memorial garden, since the foundation’s efforts elsewhere had been unsuccessful so far. But since St. Gabriel’s had agreed – even before the formal dedication on May 11 – other churches had begun to express interest, Linda said. Once the blessing was complete, members of the congregation stepped forward to lay flowers at the base of the marker. The little service closed with the singing of “Tis So Sweet to Trust in Jesus,” again accompanied by 12-year-old Anya Jacobs on the flute. To learn more about the foundation’s work at visit their website here or on Facebook here. Father of Life and Love, we thank you today that you have called us to share in the life of the one human family. We thank you for all our brothers and sisters, and ask You to deepen the bonds of love among us. We thank you especially for our youngest and smallest brothers and sisters, those in the womb. Today, Oh Lord, we remember them, while so many choose to ignore and forget them. We remember those who are living, and commend them to Your protection. We remember those who have died and we commend them to Your mercy. Father, we dedicate to You this memorial. We pray that it will serve as a witness to the humanity of our youngest brothers and sisters. We pray that it will serve as a testimony that we are responsible for them. We pray that it will provide a place where those who have lost their children may mourn and find comfort. We pray, Father, that we who are the living stones of the Church, may likewise be witnesses to the dignity of life. Give us the grace to confront the evil of abortion and eliminate it. May we see the day when all people who look upon this memorial will remember abortion only as a thing of the past, and may praise You forever for the victory of life. And may the blessing of Almighty God the Father the Son and the Holy Spirit descend upon this memorial and remain with it now and always. Kellie is working under the supervision of the Rev. Andrew Gross, Communications Director, providing general communications support as well as specific assistance with Assembly 2014. Kellie will be going into her senior year at Duquesne University in the fall, majoring in Corporate Communications, and minoring in African Studies. Kellie hopes to pursue a career in Human Resources or a related communication field. She lives with her parents and sister in McKees Rocks, Pennsylvania, and in her spare time enjoys reading. In addition to being a parish pastor for over 35 years, he was the church-planter for a nondenominational church in Mason, OH, that he later guided to become Trinity Church in the Reformed Episcopal Church. On Dec. 7, 2013, he was consecrated as the Bishop Suffragan of the Diocese of the Central States (Reformed Episcopal Church and the Anglican Church in North America). 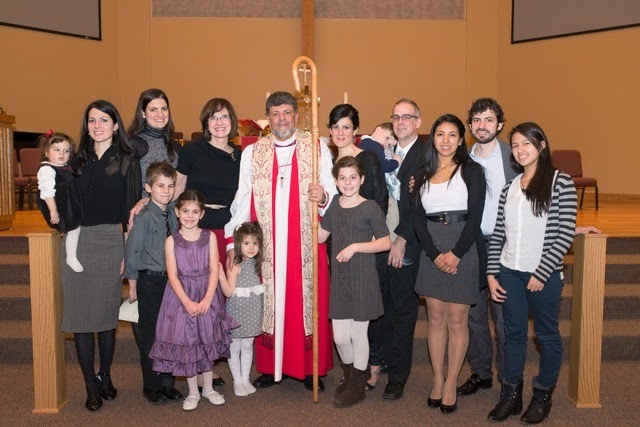 Bishop Manto has been married to his wife, Janice, for 39 years, and they have four adult children and six grandchildren. I was baptized in the Roman Catholic Church and grew up in an Italian/American Catholic home. I attended Catholic schools for junior and senior high, with the latter being an all boys school in Newark, New Jersey. I went on to attend St. Bonaventure University. I left the faith during my second year of college. I transferred to Bowling Green State University (BGSU) in Ohio for my junior year and returned to my faith in my senior year (1971-1972) amidst the campus revivals (Jesus People) and Charismatic Renewal of those days. I was part of a nondenominational student prayer group meeting on the BGSU campus that was started by a former hippie-turned-Christian. We were very active in street witnessing, Bible study, and prayer. Many students became Christians or returned to their faith through this ministry, and the group continued to grow. With the help and guidance of a local pastor, the group was eventually organized as an independent church, part of an association of Congregational Christian Churches. I was involved in the development of the church from the earliest days. I had graduated, married, and was working as a line supervisor in an Ace Hardware warehouse when I was asked to serve as assistant pastor for the church. I was surprised and had little understanding of just what being a pastor was all about, but my life had been radically changed by Jesus and the Gospel. I had a deep desire to serve and please our Lord and so, after discussing it all with my wife and our Christian friends, I agreed to become the assistant pastor of the new and growing congregation. I was ordained through the local parish and the Congregational Christian Church in 1977. I started a Christian school as a ministry of the church in 1984, and served as principal for five years while also serving as assistant pastor. I moved to Cincinnati to plant Trinity Church in 1990, and completed a seminary degree at Cincinnati Christian Seminary in 1995. Your congregation, Trinity Church, was originally a non-denominational church before it joined the Reformed Episcopal Church (REC). How did you become interested in the Episcopal/Anglican tradition? How did you introduce Anglicanism to your congregation? Trinity Church in Cincinnati/Mason was one of several church plants of the original church in Bowling Green, Ohio. The innocence, honesty, and sheer joy of knowing the forgiveness and love of Christ had launched the original group and continued to sustain the ministry, but we needed more if things were to continue. Attempts to form an association of churches failed, and eventually each local parish sought out their own affiliation. Trinity Church joined Christ the King Church, our sister parish in Dayton, Ohio, in that process. Liturgy, Sacraments, Reformation theology, episcopacy, and the ancient church had become important to us, and the Anglican world was a natural fit. Bishop Grote and the other REC bishops were very helpful to us in making the transition. Learning to use the Prayer Book, weekly communion, and following the church calendar were also particularly important in the process of becoming an Anglican parish. We began the affiliation process with the REC in 2001, and were received as full members in 2002. How do you envision your role as a bishop in the Anglican Church? What is your role as the Bishop Suffragan in the ACNA/REC Diocese of the Central States? The same: providing pastoral care for the clergy in our diocese and the parishes they serve, strengthening the networks of relationships between the various parishes, encouraging cooperation among the various parishes, and initiating outreach into each region—all the while being certain that we remain true to our Lord and His Gospel. How many churches are currently in the Diocese of the Central States? What do you believe has led to the growth of your diocese? There are currently 20 parishes and missions in our diocese. The growth in the number of parishes derived from helping small groups of people interested in Anglicanism to form mission works. The bishop assists these groups in establishing an Anglican identity and finding ways to grow in their communities. What are the mission priorities in the Diocese of the Central States? As a new diocese, we are working to establish our identity as a working and growing family of believers. By strengthening the relationships between the various parishes, as well as between the clergy of the diocese, we hope to open channels of ministry to our congregations and to our geographic region. What excites you most about ministry? The opportunity to lead people to Christ and His Church and find their place in His unfolding salvation story. You have been married to your wife Janice for 39 years. How do you balance your family life with your calling as a pastor and bishop? Janice and I will be married 40 years in August! My family enjoys preparing meals and eating together, and those times have provided points of contact for our family members amidst the demands of pastoral life. In maintaining these types of events, Janice and I have tried to lead the way for our family in making time for one another and being interested in each another. Jewish Background of the New Testament, by J. Julius Scott. The title says it all. The more we know about Judaism in the days of Jesus, St. Paul, and the other apostles, the more we know about the Faith and Church they have entrusted to us. What do you enjoy doing as hobbies or interests? I like to cook, and enjoy preparing meals for family and friends. What do you see as a major challenge facing Christians today? Individualism and consumerism in the U.S.
How do you see Anglican Christians making a difference in that challenge? I have a high regard for the power of our liturgy and sacraments in pushing back against the “cultural liturgies” of our day and challenging the individualism and consumerism with the peace and beauty of the Kingdom of God. What has being a father—and grandfather—taught you? The reality that other human beings are depending upon me to be a good example. Pray that I might have the wisdom and courage along with the mental and physical strength and health to preach the Gospel and to love and care for God’s people.